We touched on this winter’s irruption of snowy owls a couple of weeks ago but these birds continue to pop up, not only in the Carolinas but across the South and into the mid-section of the country. I recently heard of one sighting in northeastern Oklahoma and one in Arkansas, near Little Rock. The count in North Carolina is around 15. The latest I have heard of being Washington, Nc. It’s easy to get birders’ hearts pumping by mentioning irruption. An irruption (in the avian world) is an irregular movement or migration of large numbers of birds that normally winter across the northern tier of states and/or Canada into areas farther south where they are not typically found. Winter finches like evening grosbeak, purple finch, pine grosbeak, common redpoll, pine siskin, red crossbill and white-winged crossbill are some of the more common irrupters. Others include bohemian waxwing, red-breasted nuthatch, great gray owl and, in case you haven’t heard, snowy owl. As I said birders are keen on irruptions – something out of the ordinary, maybe the chance for a lifer or at least a really good tic on your state list or just simply the chance to see something different. I remember the late 1990s, around 1996 through 1998 when we had evening grosbeaks almost every winter. I thoroughly enjoy watching and feeding (and feeding) these colorful boreal visitors. But snowy owls are different. 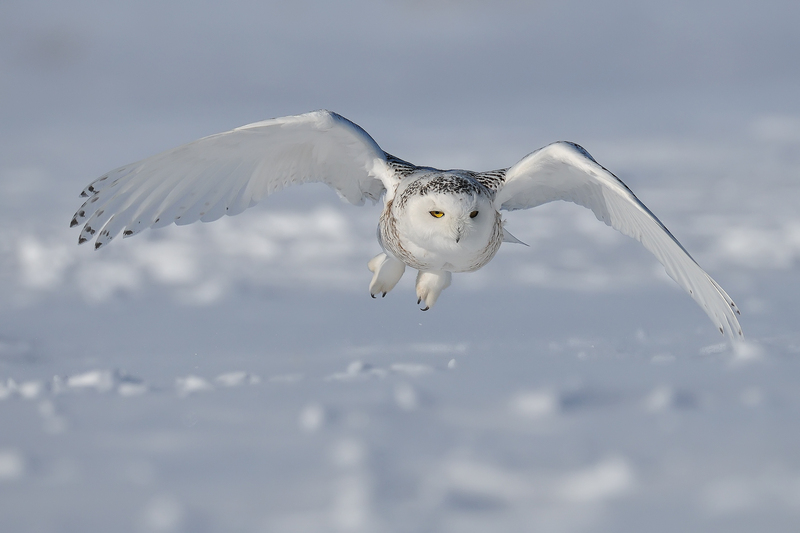 These majestic, silent, white sojourners from the cold arctic can glide deep into the soul and psyche of almost anyone who encounters one – and it has always been so even before Hedwig. Drawings of two snowy owls with chicks on the wall of a cave in Ariege, France that date back to the Paleolithic Era are some of the earliest recognizable bird drawings in the world. In Romania people believed that repentant sinners would take the shape of snowy owls as they ascended into heaven. Russian hunters carried snowy owl talons with them so that if they met with misfortune their souls could use the talons to climb into heaven. Snowys are the heaviest owl in North America weighing about four pounds. They stand about two feet tall and have a wingspan between four and five feet. They are nimble fliers and sometimes catch birds on the wing. Snowy owls are tundra nesters from the northern most reaches of Alaska to Canada and Eurasia. They normally winter in Canada, northern most U.S., Europe and Asia. They are well suited for their arctic habitat. Their feathers contain no pigment, leaving more room for air that helps to insulate against the cold. Their legs and toes are heavily feathered for warmth. This year’s irruption is large, both in numbers of owls and southerly range. Nearly 700 snowy owls have been reported so far during this year’s irruption. As we mentioned in the earlier article snowys have been found in Bermuda this year and just recently, Arkansas. The majority, if not all of these southerly wanderers are immatures. These birds are not yet accomplished hunters and have traveled incredible distances. They are most likely stressed and very hungry, even starving. Reading posts regarding sightings across the country, one sees blurbs, like – there was a lot of traffic but the bird didn’t seem to mind – or the owl seemed oblivious to all the people – more than likely, the owl was too stresses and/or weak to flee. Please give these birds as much space and quite as you can. They will have a tough enough time of it and many, perhaps most, won’t make it back to their breeding grounds – the most we can do is give them a fighting chance.